During the month of March Shay created a board to promote world oral health day. The board included information, advice and fun facts on quitting smoking, promoting healthy eating, brushing twice daily and alcohol consumption. With the summer holidays approaching, children are more likely to ask for treats and snacks, we are hoping that our message will encourage healthier options. We want to help children & adults understand the sugar content of the most popular drinks and snacks. Seeing the amount of sugar in food and drinks is more effective than reading about it on the packaging. 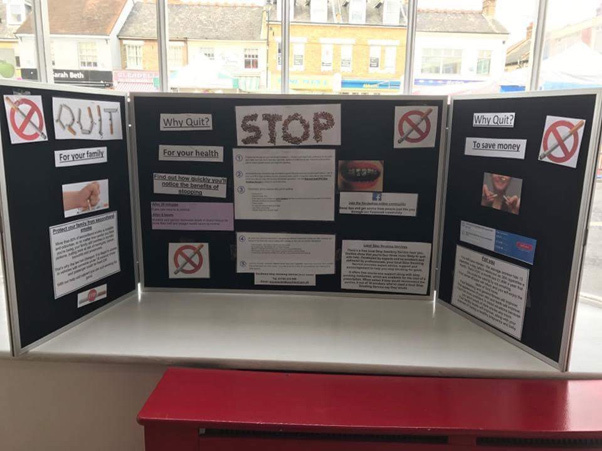 Our window has been transformed to display the amount of sugar contained in popular snacks and drinks, correct brushing technique and interesting teeth and oral hygiene facts aimed at the children. Come along this summer and bring the children to see our display next time you are in town! National No Smoking Day is a day to raise awareness about the dangers of smoking and to support individuals who would like to quit. Throughout March our eye-catching display was in our window for patients and passers-by. It contained information on why, how and the benefits of stopping smoking, giving practical advice and details of local organisations that can help. To support the local community, each year we participate in the promotion of artwork for local artists by displaying their pieces in our practice window. This year we displayed the work of local Glass Artist Keith Gravesstock. His pieces proved very popular with staff and patients! This year National smile Month celebrated its 40th year and staff enjoyed promoting oral health messages to patients reinforcing the importance of good oral health in both children and adults. Thank you to all our patients that took part in our Annual Patient Satisfaction Survey during December 2015. Your feedback is really important to us as it helps us to improve our service and we were very pleased with the results. We found 99% of our patients would recommend us to others. From April 2015 patients are invited to give us their feedback by answering a simple question. Would you recommend us to friends & family? We really appreciate your feedback and find your suggestions valuable. Please help us to help you by completing a response card which can be found in the patient waiting area along with the box to post them in. For the 'Bright Smiles, Bright Future' Campaign by Colgate, staff promoted healthy oral care habits among young patients and their families giving information about why dental check-ups are important for children, how to brush teeth properly and information about limiting sugary foods and encouraging healthy snacks. An information board was created to grab the attention of all ages, balloons and Dr Rabbit Smiley's, stickers were given to our young patients.